Can new boss Adam Murray make it three promotions at Mansfield Town? New Mansfield Town manager Adam Murray has enjoyed a memorable time at Stags with two promotions the undoubted highlight of his time at the club. Murray first tasted promotion glory during the 2001/02 season while he was on loan from Derby County. The promotion was one as Mansfield Town defeated Carlisle United at Field Mill on 20th April 2002 in a day that will live long in to club folklore. 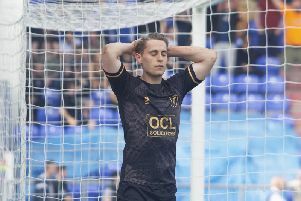 But, for Murray, Mansfield Town’s long-awaited return to the Football League after a long barren spell in the Blue Square Premier is the highlight of a memorable 15 year career. Stags defeated Wrexham on the final day of the season to pip Kidderminster to the title after an amazing run of form in the second half of the season.